Newcastle rock wunderkinds silverchair played their first live show in 12 months at a secret gig at the Cambridge Hotel last night. The hush-hush concert, organized on the quiet to give the band a chance to break in new member Sam Holloway, drew a packed crowd despite the secrecy. The act was promoted as the Australian Silverchair Show double-billed with an AC/DC tribute group but devoted supporters guessed something was afoot. silverchair rewarded the faithful and curious with a rollicking set of new and old material. It was a treat for hometown fans who paid $10 entry to cram inside the Cambridge, the renovated West End pub where silverchair played some of their earliest headline gigs. Melbourne-based keyboard player Holloway will make his official debut with Daniel Johns (vocals/guitar), Chris Joannou (bass), and Ben Gillies (drums) at the Peaches 'N' Cream festival in Cobram tomorrow. 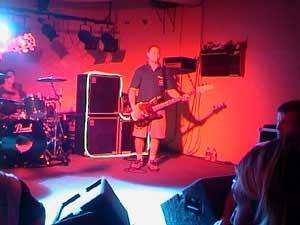 Last night was the second time silverchair appeared unannounced at a Hunter venue. They drew 800 to a concert at Newcastle University in 1996 that had been advertised only on campus. 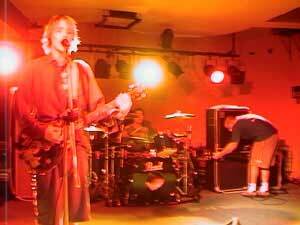 It has been 13 long months since silverchair last played a live gig. Their well earned year off has their fans eagerly awaiting their return. Rumour has it that a talented silverchair cover band is in their home town of Newcastle that is so good it is near impossible to tell them apart from the real band….. rumour was right. This reporter could not tell the difference! The venue is a Newcastle entertainment landmark the Cambridge Hotel. It is an older building with a small auditorium at the back capable of holding about 500 people. When this reporter arrived at 8 p.m. there was a small but excited crowd gathered at the entrance door, some of which had been there most of the afternoon, in the hope that the real silverchair may drop in. The crowd quickly grew until most of the footpath was taken up. The venue opened the doors and the happy crowd streamed in. The numbers quickly swelled until the place was near capacity. A half familiar face was glimpsed mingling in the crowd. It looked like Sam Halloway, the 'chair's Neon Ballroom tour keyboardist... could it be true that silverchair were here to see the cover band? 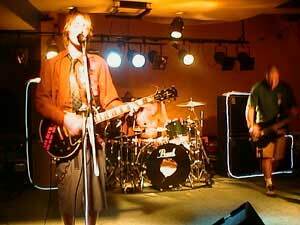 Sam Halloway was recruited from Cordrazine, a Melbourne based band that had disbanded. Because of the orchestrations on many of the silverchair's new songs, it was clear that a keyboardist was needed for the tour, and Cordrazine's break-up made Sam the right man for the job. Time seemed to tick by very slowly as the eagerness to see this mysterious band heightened. At 9:30 p.m. three figures leapt onto the dimly lit stage. The now packed crowd screamed with excitement. 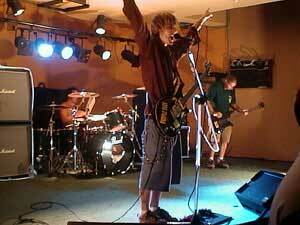 It was true, silverchair had chosen to end their sabbatical with an unannounced gig in their home town. They jumped straight into their first song being the much liked Israel's Son. Without hesitation the 'chair swung straight into this reporter's favourite new song Emotion Sickness. It is a six-minute haunting masterpiece that certainly stirs the emotions. It was very warmly appreciated by the now partying masses. Next came another new tune, Ana's Song. The beat reminded me a little of Neil Young. I was very impressed. After that came a brilliant rendition of Suicidal Dream, always a live favourite. Two new songs followed called Dearest Helpless and another new favourite of mine, Paint Pastel Princess. Bring on the release of Neon Ballroom I thought to myself. By now the warming crowd was starting to get fired up. Madman caused the simmering mosh pit to erupt as silverchair bounced around the stage. Another new song, Point of View, came next followed by the melodic Cemetery and another new one, Miss You Love, all to cool things off a little. Another live favourite Slave beat the happy crowd into another frenzy with the mosh pit almost out of control with this reporter right in the middle of it. Soon the mosh surfers were being manoeuvred left and right as silverchair belted out Abuse Me, Faultline, The Door and Freak. Yet another new song which is sure to please original silverchair fans Anthem for the Year 2000 burst into life. This song will be the first released off the new album Neon Ballroom. I for one cannot wait. With the crowd screaming for more the band left the stage for a well earned rest but that was short lived. They soon returned to leap straight into No Association, a tune that still makes my spine shiver. To finish off what was one of the best gigs I have ever seen was a rousing rendition of a song written about animal liberation, Spawn. The 'chair put everything into it and were obviously exhausted by the end. The crowd dispersed happy they had seen a very polished, highly entertaining performance. It is hard to believe these guys have not played live in over a year. Prior to the show I was eager to see how the new songs sounded live, how well the addition of a keyboardist would integrate and if silverchair had lost any of the appeal their music has for me. The only word that comes to mind at present is awesome. That is how I would describe what I witnessed tonight. The new songs were brilliant, Sam's integration worked seamlessly and far from losing any appeal the band's music and performance more than cemented my support. This awe-struck silverchair fan can say only one thing -- bring on Neon Ballroom and make it quick!